In today’s world, ratings and recommendations carry a lot of weight when considering new products. That’s why the ratings from Buyers Laboratory LLC (BLI), a worldwide leading independent evaluator of document imaging products, mean a lot when they are announced. A “Highly Recommended” rating is the highest mark a product can receive from BLI, and that is exactly what Sharp received for all ten of its Advanced and Essentials color workgroup document systems. Launched almost exactly one year ago, the color Advanced and Essentials Series workgroup document systems have made a major impression in the document imaging products and solutions industry. In December 2015, the launch of Sharp’s first six models received a standing ovation for their single-engine platform, easy-to-use common interface and common toner supplies across the line. This was closely followed by four more models in June 2016, taking the series from output speeds of 30 to 60 ppm within a matter of months. The color Advanced Series and color Essentials Series document systems are designed with users in mind, enabling them to easily setup and execute workflow tasks. Both series are equipped with Sharp’s next generation touchscreen display, offering an intuitive graphical interface with Easy Copy and Easy Scan screens, as well as quick access to on-board operation guides. Both model series also support popular mobile technologies. Multi-layered security features help ensure intellectual property and personal information is protected throughout the life of the device. The Advanced Series models offer speeds between 30 ppm and 60 ppm and are packed with easy-to-use, innovative features to help businesses manage their workflow more efficiently. These models also offer many productivity enhancements, such as high-speed scanning up to 200 images per minute and a walk-up motion sensor that brings the machine to ready condition within 10 seconds. The color Advanced Series is designed with users in mind, enabling them to easily set up and execute their workflow tasks. These models are equipped with Sharp’s next-generation touchscreen display, offering businesses an intuitive graphical interface with Easy Copy and Easy Scan screens, as well as quick access to an integrated on-board operation guide. The color Advanced Series leverages the latest version of Sharp OSA® technology for easy integration with network applications and cloud services, as well as advanced capabilities to help businesses better manage their workflow. These models also come equipped with Sharp’s multi-layered security features, which can help ensure the customer’s intellectual property and personal information is protected from the first day of operation to the time of trade-in. Contact us to learn how these systems can benefit your workplace. 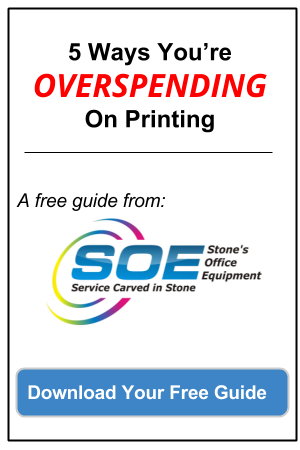 Built on the same engine platform as the color Advanced Series, the color Essentials Series document systems are designed for cost conscious customers, offering full multifunction capability at a strong value. 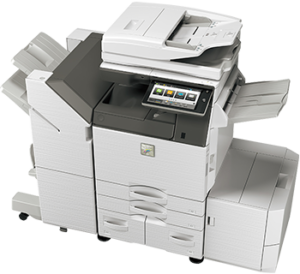 These systems offer out-of-box copying, network printing and network scanning at speeds between 30 ppm and 60 ppm. This new family of color MFP products has been designed to help businesses streamline their office workflow while providing an intuitive user experience, flexible integration and enhanced productivity. Leveraging document imaging products that are easy to use, efficient and reliable is a key component for a highly-functional office; one that not only supports your work but enhances it. The color Advanced Series and color Essentials Series document systems do just that and they have been recognized for doing so. If you want to enhance your productivity and quality of work, we “highly recommend” considering Sharp’s color Advanced Series and color Essentials Series. Contact us today to learn more about these and other office solutions options.